With Team Password Manager's simple export feature admin users can export all of the passwords in the system into a CSV file to be given to clients or to be used as backup. CSV files are text files that have each field separated by comma and are readable by software like Microsoft Excel. Admin users can export all passwords or only the passwords of a particular project. Likewise, admin users can also import lists of passwords from a CSV file into the system with no hassle. So, if you need to transfer a large list of passwords or you're switching from one password management system to Team Password Manager, the process is quick and easy. Please read How to Export and Import Passwords from the docs section to see how exporting and importing password works in Team Password Manager. 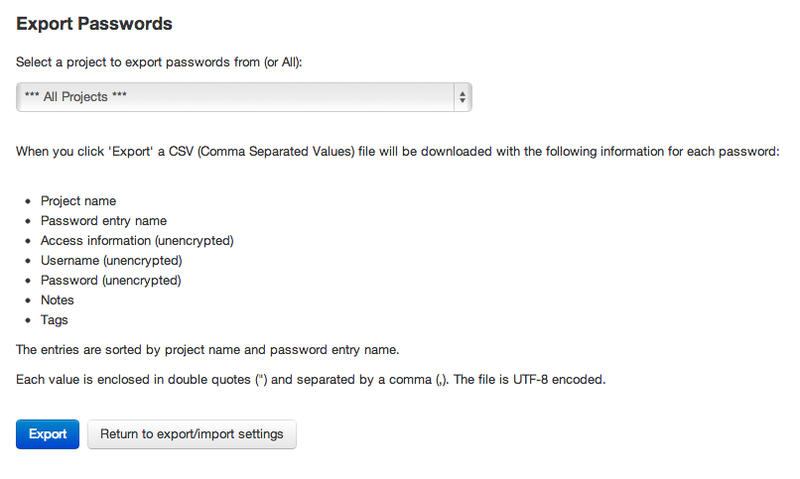 Users can also export/import their personal passwords ("My Passwords") to/from a CSV file.